National BestsellerSelected as one of NPR’S Top 100 Science Fiction and Fantasy Books of All TimeThe #1 New York Times bestselling author’s ultimate edition of his wildly successful first novel featuring his “preferred text”—and including his special Neverwhere tale, “How the Marquis Got His Coat Back” Published in 1997, Neverwhere heralded the arrival of a major talent and became a touchstone of urban fantasy. Over the years, a number of versions were produced both in the U.S. and the U.K. Now Gaiman’s preferred edition of his classic novel reconciles these works and reinstates a number of scenes cut from the original published books.Richard Mayhew is a young London businessman with a good heart whose life is changed forever when he stops to help a bleeding girl—an act of kindness that plunges him into a world he never dreamed existed. 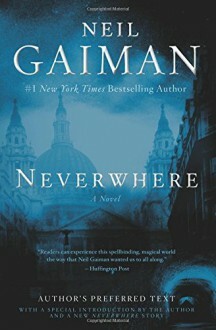 Slipping through the cracks of reality, Richard lands in Neverwhere—a London of shadows and darkness, monsters and saints, murderers and angels that exists entirely in a subterranean labyrinth. Neverwhere is home to Door, the mysterious girl Richard helped in the London Above. Here in Neverwhere, Door is a powerful noblewoman who has vowed to find the evil agent of her family’s slaughter and thwart the destruction of this strange underworld kingdom. If Richard is ever to return to his former life and home, he must join Lady Door’s quest to save her world—and may well die trying.Neil Gaiman is the #1 New York Times bestselling author of more than twenty books, and is the recipient of numerous literary honors. Originally from England, he now lives in America.